Rules of Golf: Disqualified for Wearing the Wrong Spikes! If you are playing any round of competitive golf, by that I mean playing in a competition where there are other competitors that are not playing in your group, then you are not only playing to the 34 Rules of Golf, as jointly published by the R&A and USGA, but are also subject to the Local Rules and Conditions of Competition in operation. Whereas, Local Rules are introduced to clarify the course marking, or to provide relief from local abnormal conditions that are not covered by the Rules themselves, Conditions of Competition are the foundations on which a competition is built. As with the Rules of Golf, a player cannot avoid being penalised for a breach of a Local Rule or Condition of Competition because they were not aware of it. Two-time US Open winner, Lee Janzen, learned this the hard way last week when he was disqualified for wearing …. wait for it …. the wrong type of spikes! 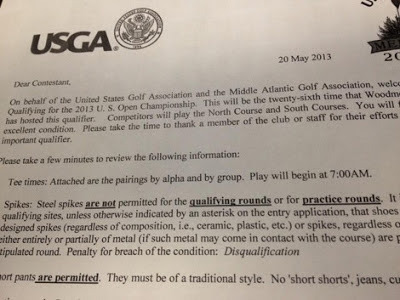 Below is an extract from the letter that was emailed to all the 2013 US Open Championship qualifier entrants more than a week before qualifying commenced. Janzen confirmed that he did not bother to read these instructions. I presume that he now wishes that he had, because following his first-round on the North Course in Woodmont Country Club in Maryland, he was approached by an official and asked if he was wearing metal spikes. When he confirmed that he was he was told that this was not permitted and was disqualified. Janzen was not pleased. He complained that he has never not worn metal spikes, even in several previous US Open qualifiers. One imagines that he may have been even more vociferously critical of the reason for his disqualification had he not just taken 75 strokes for a 3-over par score that probably would not have been good enough for him to progress much further anyway. Of course, the reason that some (most?) courses prefer players to wear soft spikes rather than metal spikes is to prevent damage, particularly to the putting greens. Damage made by spikes must not be repaired if it might assist the player in his subsequent play of the hole, Rule 16-1c. Interestingly, there have been instances where amateur golfers have sued their Clubs for disallowing them from wearing metal spikes; usually after they have injured themselves by slipping over whilst wearing soft spikes, as if no golfer wearing metal spikes has ever suffered the same misfortune. To my knowledge, no-one has ever been awarded material damages on such a claim, but the threat has led to some Clubs adjusting their policy on the matter. I know that at my own Club they changed the mandatory instruction to wear soft spikes to a ‘recommended’ request! If you think that the above disqualification penalty was harsh, I suggest that you check out my blog entitled, ‘The Worst Golf Ruling Ever?’ at this link. If you have a question on the Rules of Golf, try entering a search query in the ‘Search This Blog’ box at the top right of my web site home page. You will often find the answer contained in previous blog items. For example if you enter ‘”spike marks”, you will be directed to my blog, ‘Rules of Golf: Spike Marks - Rule 16-1c’. Yeah i agree with this post, and i appreciate you for post 100% rite post. It is foul or we can say that not allowed to wear wrong spikey shoes at golf court. If noticed you can disqualified from game.